HAWAII—Mauna Kea soars above Hawaii’s Big Island, a focal point in the island’s geography and in its politics. At nearly 14,000 feet above sea level, the snow-capped summit is the highest point in the Pacific, and the now-dormant volcano is home to much native Hawaiian mythology and history. Indigenous Hawaiians aren’t the only ones drawn to the mountain. Climate scientists have measured the amount of carbon dioxide in the atmosphere here since 1958, providing some of the longest-running data on environmental change in the world. Mauna Kea’s elevation and environment also make it ideal for astronomy; there are few places on earth with such clear, dry skies, and nearly no light pollution. It is one of the best places in the world to stargaze. From most angles, the telescopes on Mauna Kea are invisible. But they are never far from public eye. The first instruments were constructed by the University of Hawaii and the U.S. Air Force in 1970. But as quickly as international astronomers descended upon the peak, local protesters began agitating for their exclusion; when Canada and France proposed a joint telescope in 1973, some Hawaiians began expressing worries about the environmental effects of so many observatories. Those fears have never entirely been put to rest, even as the construction of more telescopes moved forward. Along the summit road, domed buildings now house 13 telescopes ranging in size from less than one to 25 meters. The facilities occupy a 525-acre “astronomy precinct” in a reserve set aside for scientific research. In winter, snow and ice encircle the observatories, blending with clouds that rim the mountain’s peak to form an otherworldly picture—a city of science at the top of the world. In 2005, activists opposed the proposed expansion of the NASA Outrigger telescope after the project’s own environmental impact statement found its cumulative effects would be “substantial and adverse.” A subsequent ruling found that the world’s largest astronomical observatory needed a more consistent and comprehensive management plan. Riding on that success, Hawaiian activists made national headlines in 2015 when several protesters were arrested for demonstrating against the construction of another telescope on Mauna Kea’s sacred slopes. But this is not just any instrument. The Thirty-Meter Telescope (TMT) would be the biggest telescope on the planet—bigger than the Hubble. It would allow astronomers to see to the furthest edge of the galaxy. “This represents perhaps an order-of-magnitude better instrument than the telescopes we have,” explains Paul Coleman, a professor at University of Hawaii-Manoa’s Institute for Astronomy. “Because of its size, it will allow us to look right up to the furthest we can possibly look in the universe.” The TMT would be constructed not at the summit, with the other observatories, but along the north plateau of the mountain. A judge ordered that construction of the TMT be halted on the grounds that the community had not been properly consulted. Public hearings about whether the telescope will move forward concluded earlier this month, and the judge is now considering additional materials and arguments. The decision in this case will set a precedent for future indigenous land rights debates, both in Hawaii and around the world. Mauna Kea soaring above Hawaii’s Big Island. This clash has often been seen as a battle between indigenous mysticism and the advancement of science, but it actually has more complex roots in Hawaiian sovereignty—and, in turn, in environmental conservation. “Hawaiians have never been against astronomy,” says Kealoha Pisciotta, one of the most vocal dissenters against the TMT. “I descend from navigators…There’s nothing wrong with science.” But, she says, there are more important issues facing the world—and the scientific community—than astronomical events on the edge of the universe. “We’re living in a world that’s in crisis,” she says. She argues that astronomy, which is “done by people with time on their hands,” shouldn’t be a priority—especially when it interferes with the sacred environment of the Hawaiian people. “We’re earth protectors, we’re not protesters,” Pisciotta says—a phrase that resonates with recent indigenous activists’ work opposing the Dakota Access pipeline. Indeed, several Mauna Kea protectors also traveled to participate in Standing Rock protests, partly in gratitude for Sioux support of the TMT fight. “We are not alone, and in these times of serious impact, desecration, construction and destruction we have no choice but to unify not just for ourselves, our people and all people,” Pua Case told NBC. A protest by the local group Occupy Hilo against the TMT telescope on Mauna Kea. Clean water is one such right, according to Pisciotta, and an important part of Mauna Kea’s history. Native Hawaiians gathered snow from its summit to use in traditional ceremonies, and the mountain contains several aquifers. Pisciotta worries that these aquifers could become polluted by the hazardous materials often used by telescopes—from mercury, which may be used to clean a telescope’s mirrors, or ethylene glycol and fuel. If these materials were to leak from the observatory, Pisciotta fears, they might flow through the porous lava rock and contaminate the mountain’s water. But TMT backers have long argued that the facility will have a minimal effect on the environment. “TMT will install a zero-discharge wastewater system, with all wastewater collected and transported off the mountain for proper treatment and disposal,” says Scott Ishikawa, a TMT spokesperson. In addition, Ishikawa says, the facility would not use mercury at all, and would employ other safety measures for hazardous materials, such as reinforcing the walls of fuel tanks and pipes and installing electronic monitors to detect leaks. "We build on sacred places all the time." “This is really not the telescope to fight,” says astronomer Paul Coleman. He calls the TMT “one of the most environmentally sound telescopes I’ve ever seen.” Other telescopes have a much greater environmental effect, he points out, especially those without zero-waste policies and more risks of hazardous spills. He believes protesters have latched onto this case because of the high-profile nature of the largest telescope on Earth. “It’s a lightning rod—an easy lightning rod,” he says. Land use has been much more environmentally disruptive, he argues, but it gets considerably less attention. “For native people, all the lands are sacred, that is true,” concedes E. Kalani Flores, a cultural practitioner and professor at Hawaii Community College. “But among these lands, there are areas that are more sacred than others, more holy than others.” Mauna Kea’s significance, he says, rises above the usual reverence for land. “In addition to talking about the protection of the environment and natural resources on Mauna Kea, we’re also talking about the protection of native Hawaiian traditional and customary practices and rights,” Flores says. In Hawaii, he explains, natural resources and cultural resources are the same. “Native Hawaiians’ culture is directly tied to the environment,” he says. “Things are out of balance already on the mountain." Flores argues that a pro-development perspective is “the western mentality that’s impacting native communities throughout the world”—the idea that scientific or commercial advances overrule the rights of indigenous peoples. “There’s a total disregard for native Hawaiians, a total disregard for culture and practices, a total disregard for sacred sites,” he says. If the telescope does not move forward on Mauna Kea, the TMT facility will instead be built in the Canary Islands. “That would be a huge shame for the astronomy and science community,” Paul Coleman says, because the Canary site wouldn’t be as good as the Big Island location. But more importantly, Hawaiians would lose their recently acquired status as an international astronomy destination. Astronomy isn’t antithetical to being Hawaiian, Coleman says. It’s integral to their identity. “The really defining characteristic of Hawaiians is that we live here,” he says. “That’s a really more profound statement than you think.” Every native resident owes their heritage to an ancestor who traveled by canoe and navigated by star to the island—and that rich history of astronomy continued after arriving in the islands. Prior to Pisciotta’s work opposing telescopes, she operated them. She was a telescope systems specialist for 12 years, assisting visiting astronomers in their work. “I started realizing the landscape was becoming more dominated by human structures,” she says. “It’s one thing to have one or two telescopes”—but she objects to Mauna Kea becoming the center of the international astronomy community. She sees the opposition to the TMT as laying the groundwork against future telescope projects. 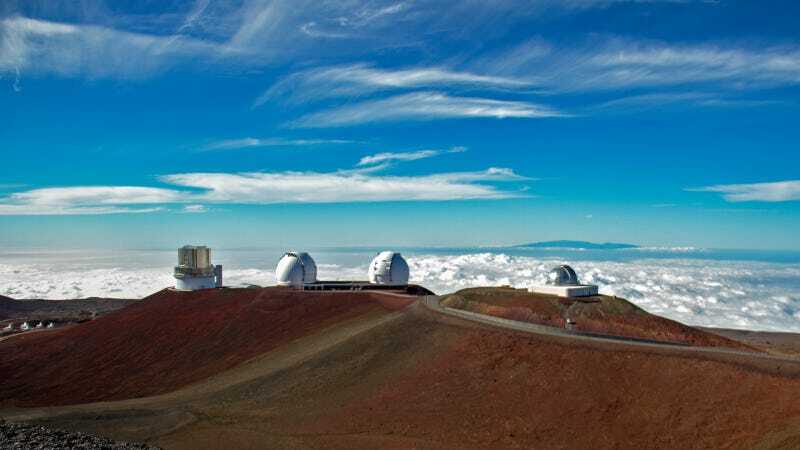 The Hawaii state supreme court recently ruled in favor of the Daniel K. Inouye telescope on Maui. This may set a precedent for the Mauna Kea case. Coleman, for his part, would like to put the matter to a vote. “Every native Hawaiian has to make up his or her own mind,” he says. He worries that the discussion has been dominated by those strongly in favor or strongly opposed, without taking into consideration the majority view. “Every Hawaiian’s opinion should matter,” he says. If the TMT project does move forward, Coleman says, it will set an example for inclusive, low-impact telescope development. “This telescope—by doing it the right way—sets precedence,” he says. It puts pressure on other telescopes to plan for a low environmental impact and to work with the local community on establishing workforce development and college scholarship funds. “All these great things that came from very long discussions with native groups,” Coleman says. “I hope that nothing changes, because they did a really fantastic job,” Coleman says, calling the project “a really groundbreaking attempt at what should have been done at the beginning” of Mauna Kea astronomy development.